Sink into the burly, brawny Bruticus to ease your body after a long day on the job. Part of our Beast® line of recliners that feature a heavy-duty frame with heavily reinforced joints, a 7-gauge mechanism and tested to withstand 400 pounds of everyday use. The quilted, shirred back cushion and thick seat offer plush, yet sturdy padding that'll put any recliner to shame. The heavily padded arms will stand up to the rigors of everyday use. Pull back and effortlessly swing your feet up, then lean back and enjoy a book, newspaper or even an evening snooze! If you're choosy, you'll love this: Best Home Furnishings allows you to customize Bruticus with any of the designer select fabrics! One of the largest recliners in the industry, this Beast® recliner features extra support, extra durability and extra comfort. 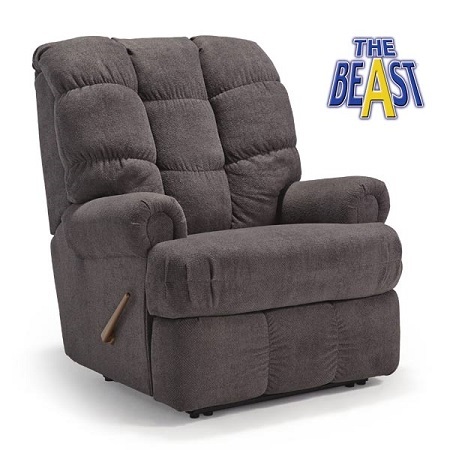 Part of the Beast recliner collection, this beefed up rocker recliner features a lower seat height and smaller seat depth than others in the Beast recliner selection for a more custom fit.